Individuals interested in participating in the Academy as trainers are welcome to visit the Trainers Database section and submit their application. Organisations looking for trainers in a particular field can search through the ITI's extensive database (when completed) and select professional artists and highly-qualified arts managers, based on desired areas of expertise and languages of training. Alternatively, organizations can write to the Academy to request for recommendations. Those wishing to hire a particular trainer need to contact the General Secretariat of ITI for further information on the procedure to follow and all contractual details. In order to ensure quality control, strict rules for the creation and use of the database of trainers are in the process of development. The same applies to rules regarding funding allocated through the Academy. An international group of advisers will be responsible for the approval of all submissions. All workshops, seminars, master classes, residencies or similar activities must be documented. 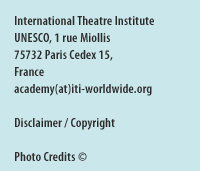 For the purposes of promoting the work of the Academy, participants in Academy activities (trainers, students, organisers) will have the obligation to document their participation through photo, video and/or print. The documentation can be published on this website and/or in print.